Redingote frock coat There are 59 products. 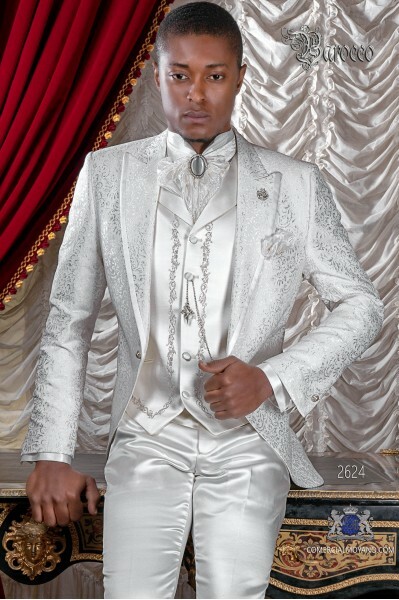 Groom suit coat Baroque. This is a vintage dress coat model mandarin collar with rhinestones, breast pocket, tailoring pockets with flaps and snap inclined stylish fantasy. 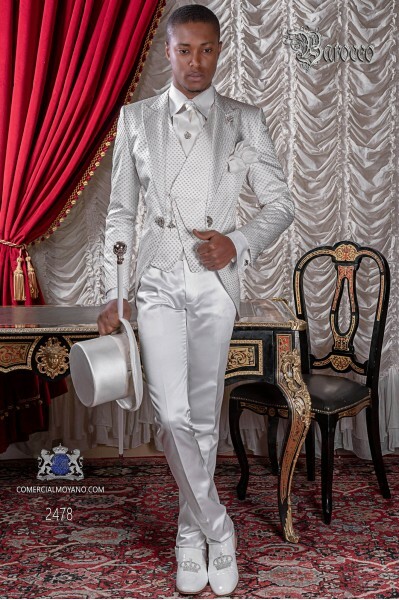 Manufactured in white jacquard fabric. 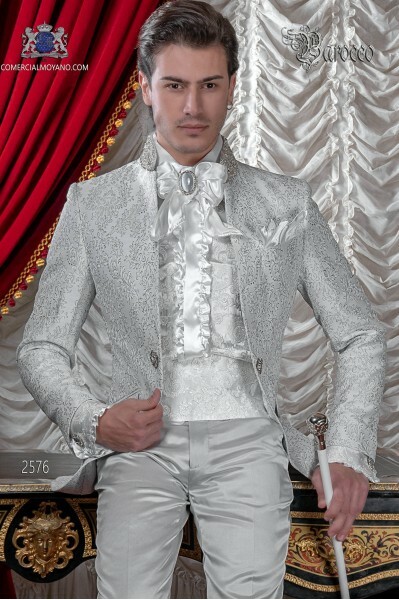 Tuxedo wedding suit 2573 baroque collection Ottavio Nuccio Gala. It comes with Ottavio Nuccio Gala garment bag. 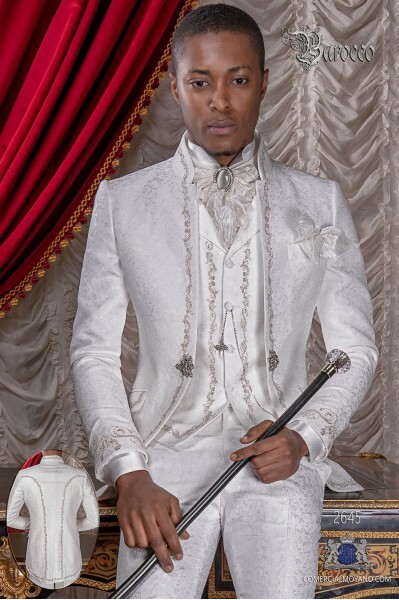 Baroque white brocade bespoke coat with crystal rhinestones. 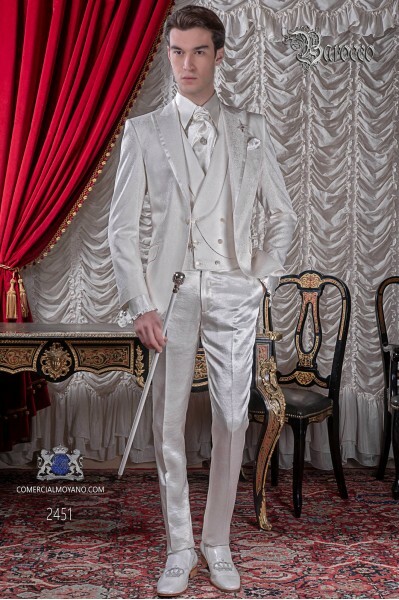 Tuxedo wedding suit 2572 Baroque Collection Ottavio Nuccio Gala.Coordinated with trousers and white satin waistcoat. 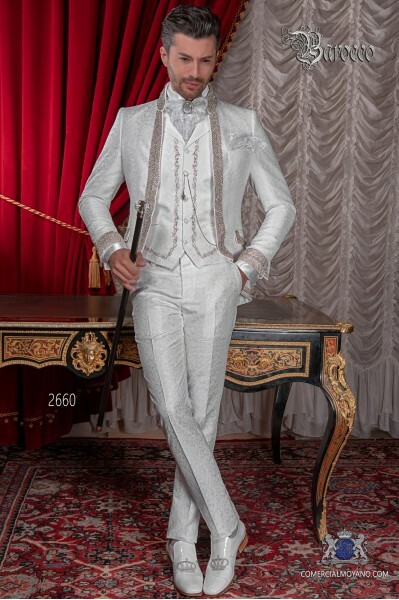 Baroque wedding suit, vintage frock coat in white floral brocade fabric, Mao collar with rhinestones, tuxedo wedding suit 2660 Ottavio Nuccio Gala Baroque collection.It comes with a suitcase bag Ottavio Nuccio Gala. 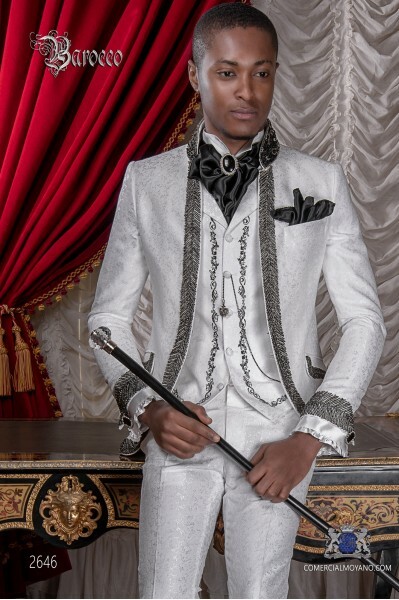 Baroque wedding suit, vintage frock coat in white floral brocade fabric, Mao collar with black rhinestones, Tuxedo wedding suit 2646 Ottavio Nuccio Gala Baroque collection.It comes with a suitcase bag Ottavio Nuccio Gala. 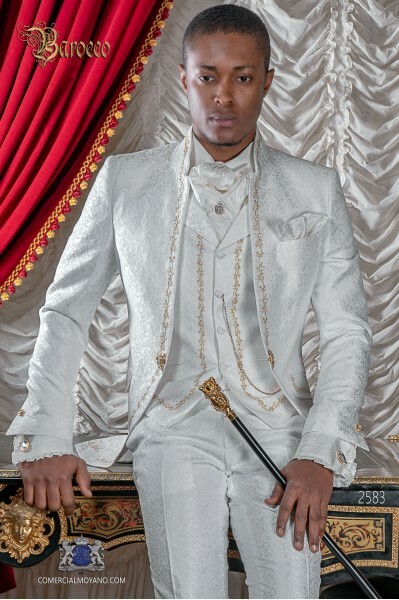 Baroque white satin frock coat with golden embroidery and crystal brooch. 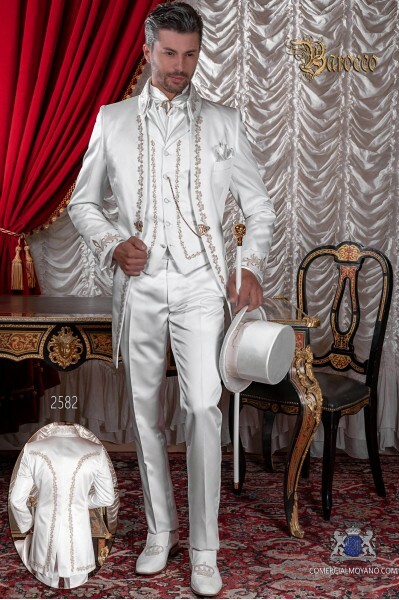 Tuxedo wedding suit 2582 Baroque Collection Ottavio Nuccio Gala. 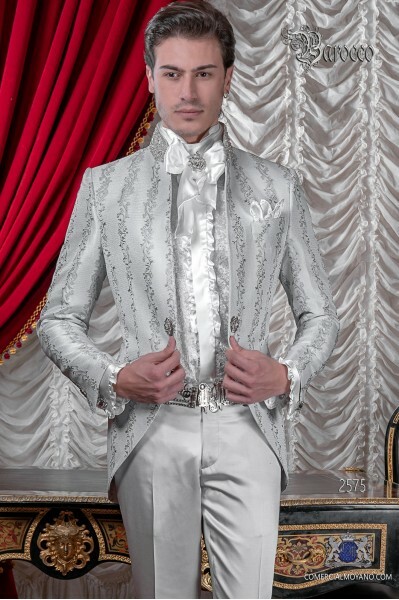 Baroque white microdesign silver frock coat with pointed lapels, silver brooch and white satin trousers. 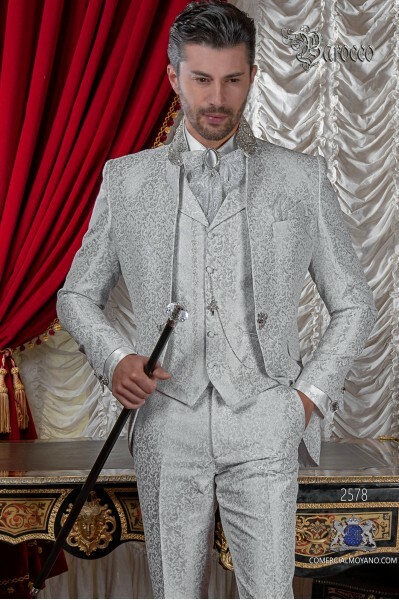 Tuxedo wedding suit 2478 Baroque Collection Ottavio Nuccio Gala. 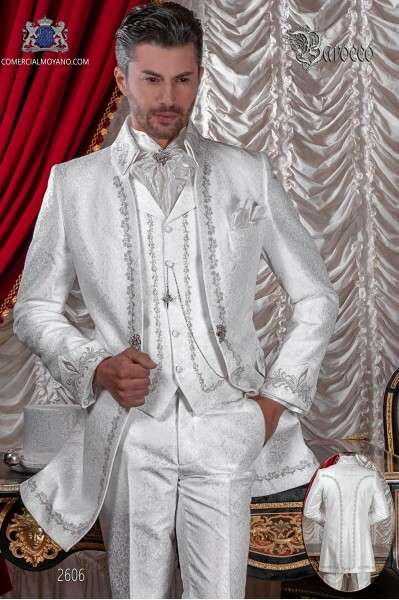 Baroque tuxedo wedding suit made of white jacquard fabric. This is a vintage dress coat lined model with peak lapels with satin profile, breast pocket, pockets with stylish tailoring inclined flaps and clasp closure. 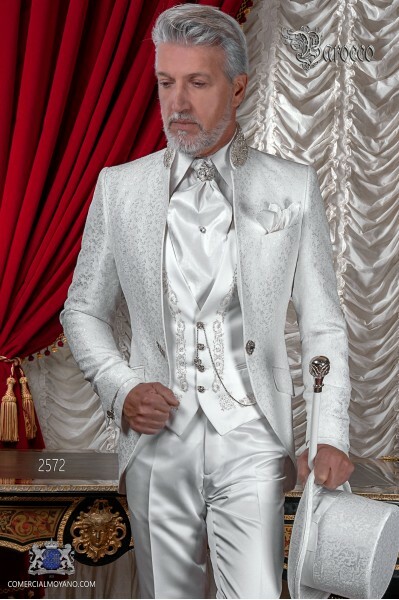 Tuxedo wedding suit 2624 Barroco collection. 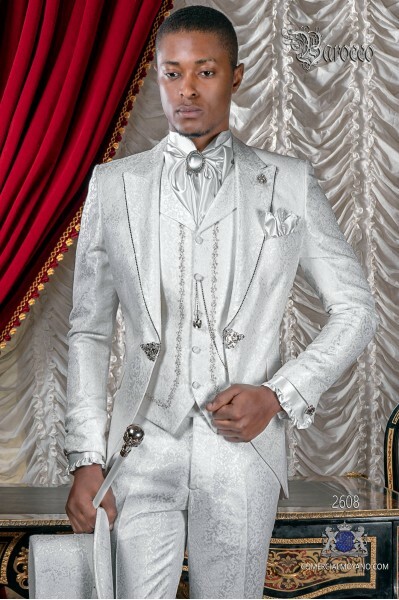 Coordinated with trousers and satin waistcoat. 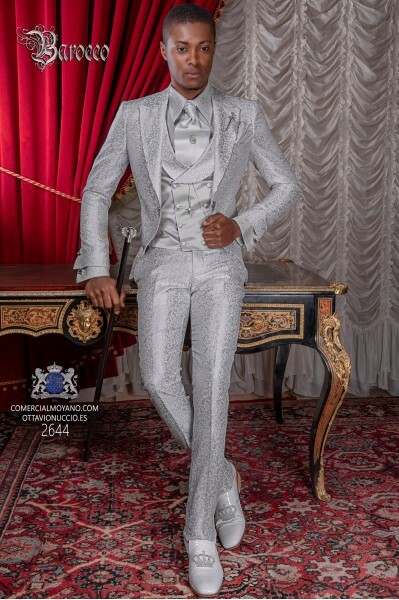 Italian bespoke with a special jacquard fabric in ivory suit with peak lapels, satin contrast and 1 button. 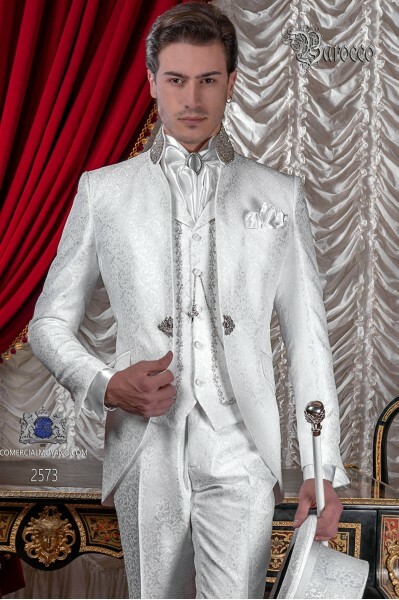 Tuxedo Wedding suit 2638 Barroco Collection Ottavio Nuccio Gala. Complete the outfit with ivory waistcoat, double breasted in teh same fabric. 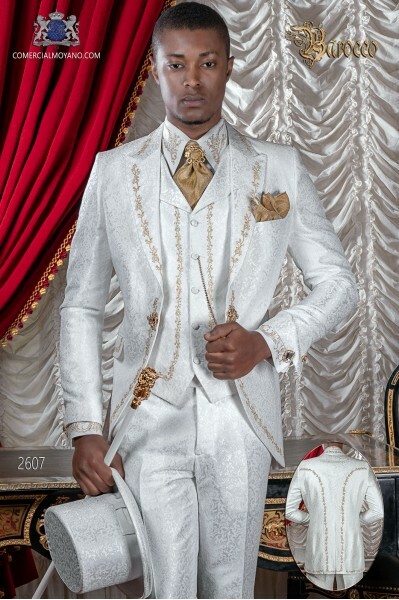 Italian bespoke with a special jacquard fabric in ivory suit with peak lapels, satin contrast and 1 button. 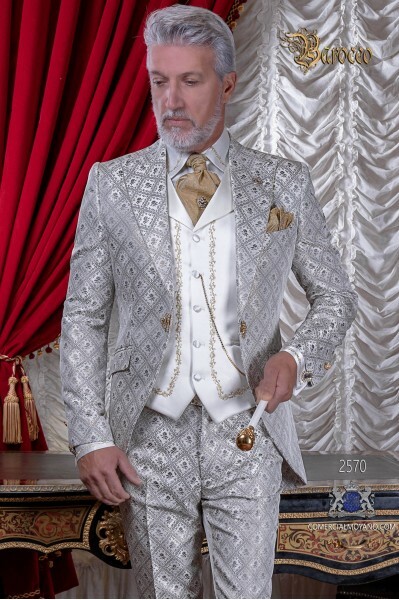 Tuxedo Wedding suit 2451 Barroco Collection Ottavio Nuccio Gala. 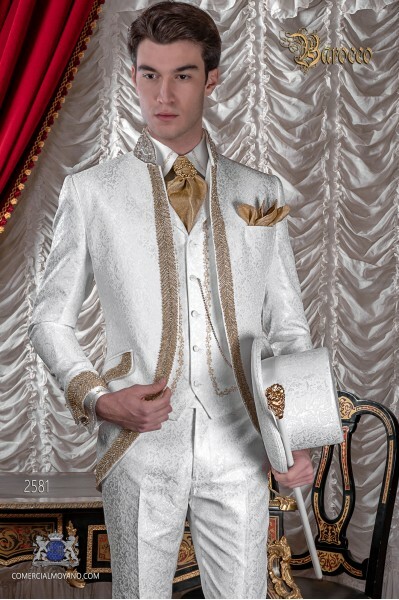 Complete the outfit with ivory waistcoat, double breasted in teh same fabric. 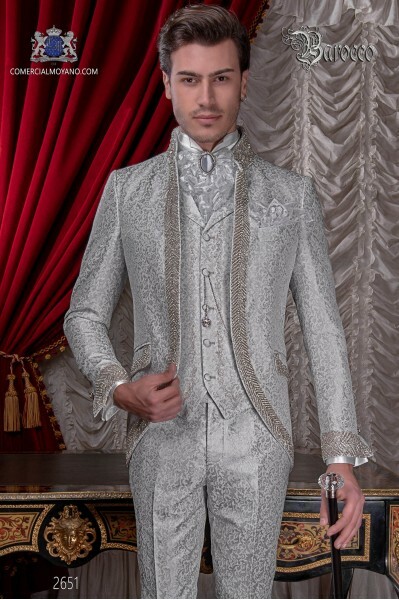 Vintage Men wedding frock coat in pearl gray brocade fabric with Mao collar with rhinestones, tuxedo wedding suit 2578 Ottavio Nuccio Gala Baroque collection. 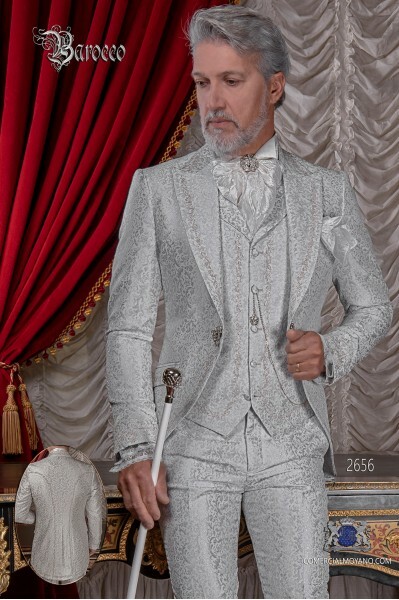 Baroque wedding suit, vintage Mao collar frock coat in pearl gray floral brocade fabric with rhinestones, tuxedo wedding suit 2651 Ottavio Nuccio Gala Baroque collection.It comes with a suitcase bag Ottavio Nuccio Gala. 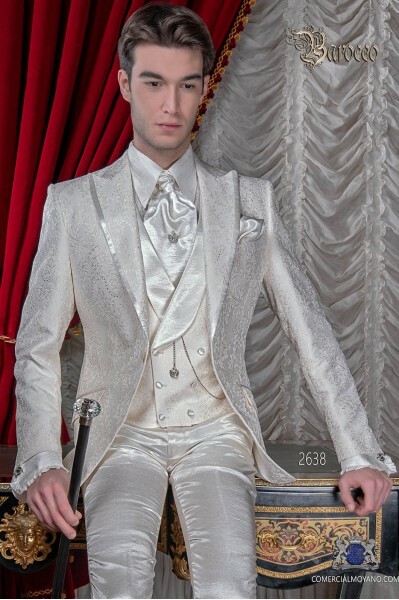 Baroque brocade ivory and gold frock coat with golden crystal rhinestones, gold brooch and ivory satin waistcoat. 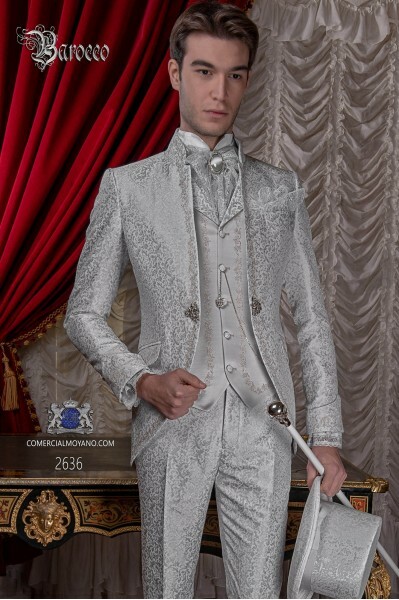 Tuxedo wedding suit 2570 Baroque Collection Ottavio Nuccio Gala.